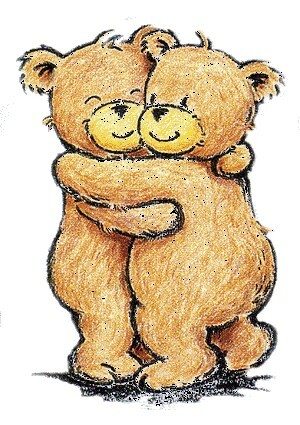 I know I haven't been around a lot lately, and so you all deserve a hug for sticking with me. Let me tell you that this has been a pretty difficult set of weeks, and yet I feel like I'm stronger because of them. My determination to stay happy in spite of circumstances is really driving me to be productive and have a good outlook. Of course it does help that I have great friends! My grandfather is really ill. He's home now, but chances are he won't be around much longer. If I'm not around that much there will still be posts. You know me, always a planner. I am trying to spend as much time with my family as possible. It gave me the stark reminder that you can never have too many good memories with someone. You never know when the possibility for those memories might be ripped away from you. So make them fun, and make them numerous. Give someone you love a hug today. Tell them how much they mean to you. Most of all, keep smiling. No one can take that positive attitude away from you, as long as you hold fast to it.